See grades awarded above. Further comment is superfluous. This modern and chick bed frame and headboard feature an arched base with sleek chrome metal legs, a high headboard all finished in quality upholstered material of the color of your choice. The glossy polyurethane finish adds another layer of visual appeal for contemporary designers. Assembly required. Dimensions 82" x 92" x 49"
"can I use an adjustable electric base your king bed"
It is not recommended as this bed is not made to support those. "Can you please, specify what is the bed's actual sitting heigth? 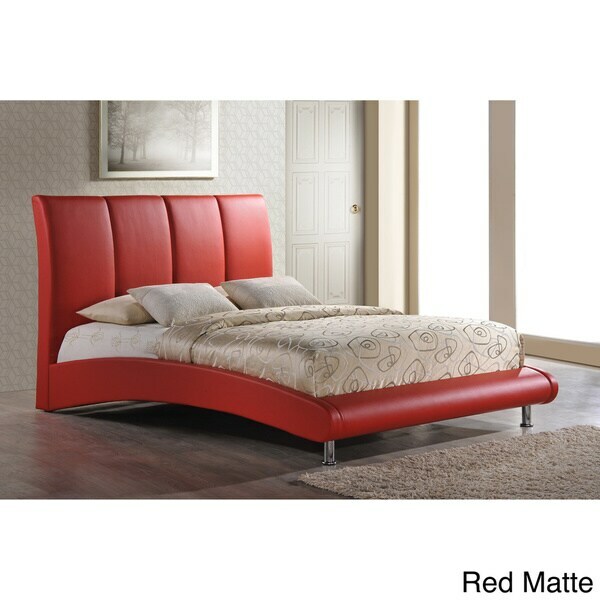 The spec height only specifies the headboard." Hello Macy. The sitting height would be 13 inches and then whatever size mattress is selected would add to that. Please let us know if you have any further questions. "Can this frame hold both mattress and box spring? What exact material is this made of?" Hello zoomzoomkat, with the King PU Bed would work better with just the mattress. The King PU Bed is made of polyurethane and Medium density fibre board. Please feel free to contact us again with any further questions. Thank you for shopping with us!